Experiments offer the promise of controlling chemical reactions molecule by molecule. In principle, the properties of any given chemical bond can be completely solved with quantum mechanics, but in practice—especially in the case of molecules adsorbed on surfaces—it’s not so easy. “And that’s why we need very accurate data at the molecular level,” explains Ho. The two Cornell researchers chose to combine iron atoms and carbon monoxide molecules on a silver surface. Not only are metal carbonyls (as the compounds of metals and CO are known) relatively simple, but they are also among the best-studied compounds in surface science, thanks to the importance of the metal–carbonyl bond in industrial catalysis. Even so, it has proven difficult to determine how many CO molecules attach themselves to the metal atoms, and how they are bonded. To begin their experiments, Lee and Ho sprinkled a sparse layer (0.001 monolayer) of Fe atoms on the Ag surface by evaporating Fe over the surface at 13 K. They repeated the procedure with CO (also at 0.001 monolayer) to create a mixed covering of adsorbates, whose positions they determined with their STM. To form Fe(CO), they first positioned the STM tip over a CO molecule and then increased the tunneling current and voltage to draw the molecule from the surface—a technique demonstrated three years ago by Ludwig Bartels, Gerhard Meyer, and Karl Heinz Rieder at the Free University of Berlin.3 Next, Lee and Ho positioned the tip over an Fe atom, reversed the current and reduced the voltage to deposit the CO molecule. In the last step of molecule building, they created Fe(CO)2 by depositing a second CO molecule on the newly created Fe(CO) molecule. The column of false-color images in the figure below shows how the various adsorbates appear to the STM. 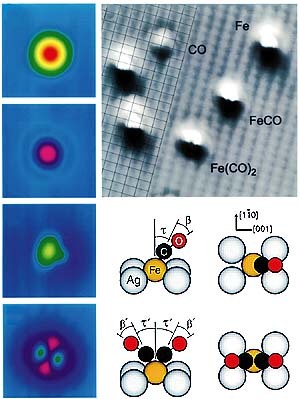 In the top two images, Fe and CO look symmetric, which means, in the case of CO, that the molecule’s bond is vertical. However, the image of Fe(CO) is lopsided, indicating that the CO molecule is tilted with respect to the surface. The image of Fe(CO)2 has two matching side lobes, each corresponding to a CO molecule. Just because you see atoms together doesn’t mean they share a chemical bond. An STM samples the electronic structure of a surface—specifically, the electronic states near the Fermi level of the substrate and the outer orbitals of the adsorbates. By itself, the STM can’t directly determine the chemical nature of a surface. As Paul Weiss of the Pennsylvania State University puts it: “With STM images you get a picture of a bunch of bumps.” To characterize the bumps, Lee and Ho made use of a technique known as inelastic electron tunneling spectroscopy (IETS). The threshold phenomenon that forms the basis of IETS was discovered by Robert Jaklevic and John Lambe in 1966—nearly two decades before the STM was invented. Working in Ford Motor Co’s scientific lab, Jaklevic and Lambe noticed that the differential conductance dI/dV in tunneling junctions abruptly increased at certain bias voltages.4 These voltages, they found out, were consistent with the vibrational energies of O–H and C–H bonds found in impurities buried somewhere in the thin metal oxide layer that separates the two metal electrodes. The phenomenon is inelastic because electrons excite molecular vibrations (thereby losing energy) as they tunnel across the gap. But the electrons can excite a vibration only if they retain enough energy to land above the Fermi level when they reach the other side of the gap—that is, provided the voltage V is such that eV > hn. Because the changes in dI/dV are small and hard to spot, IETS practitioners plot d2I/dV2, which, as shown in the adjacent figure, should appear as a sharp peak at a voltage of hn/e. IETS has been successfully applied to various junction systems for some time, but it wasn’t until 1998 that Ho with his graduate students Barry Stipe (now at IBM’s Almaden Research Laboratory) and Mohammad Rezaei (now at Transaction Information Systems, Inc) obtained the first IETS spectrum of a single molecule—acetylene—with an STM.5 In effect, their technique makes a junction of the surface, molecule, and tip, and involves positioning the STM tip over the molecule, turning off the feedback (which controls the tip’s vertical displacement) and ramping the tunneling voltage from a preselected initial value through the expected vibrational peak to an upper value and back down again. 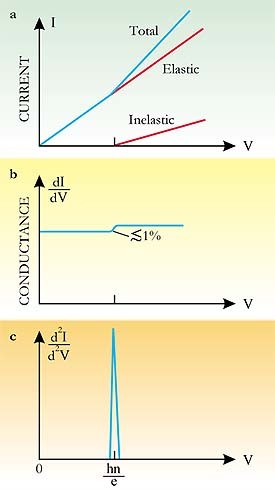 Despite its conceptual simplicity, the technique of using an STM for vibrational spectroscopy is extremely exacting. The STM tip has to be positioned over the molecule with a precision finer than 0.01 nm horizontally and 0.001 nm vertically. Temperatures lower than 10 K are required to reduce the temperature-dependent broadening of the d2I/dV2 peak. And background is a problem. Bumpy features in the signal arise not only from vibrational modes, but also from the acute sensitivity of d2I/dV2 to the electronic structure of the tip-molecule-surface junction. Even when the ploy of plotting d2I/dV2 against V is used, the vibrational peak may be impossible to discern because it is mixed in with background features. Fortunately, Ho and his group had another trick up their sleeves: isotopic substitution. As well as making Fe(CO) and Fe(CO)2 with isotopically normal 12C16O, they also made Fe(13C18O), Fe(13C18O)2, and Fe(12C16O)(13C18O). Isotopic substitution helps not only to associate the peaks with vibrational modes—because it shifts the peaks by a predictable amount—but also to mitigate the background features—because the isotopically substituted spectrum can be subtracted from the unsubstituted spectrum. The value Lee and Ho obtained for the vibrational energy of the C–O stretch in Fe(CO), 236 meV, is close to the value of 234 meV obtained with infrared spectroscopy for a layer of CO adsorbed on a Fe surface. And the shifts in energy due to isotopic substitutions match not only theoretical predictions for gaseous iron carbonyl and bicarbonyl, but also experimental measurements for CO bonded to iron in hemoglobin. Furthermore, the small difference in the C–O stretch energy between Fe(CO) and Fe(CO)2 agrees with the value calculated for gaseous molecules. Successfully measuring the vibrational spectrum of a single CO molecule, difficult though it is, does not mean that any molecule can be characterized in that way. For one thing, experiments have shown that not all the vibrations of a molecule are observable, and some peaks are even negative. Moreover, the influence of the surface shifts the vibrational energies from their values in the liquid and gas phases. But as more data are collected, the mechanisms that underlie STM-IETS are becoming better understood and, believes Ho, portend the use of vibrational spectra as the fingerprints of adsorbed molecules. 1. H. J. Lee, W. Ho, Science 286, 1719 (1999). 2. D. M. Eigler, E. K. Schweizer, Nature 344, 524 (1990). 3. L. Bartels, G. Meyer, K. H. Rieder, Appl. Phys. Lett. 79, 213 (1997). 4. R. C. Jaklevic, J. J. Lambe, Phys. Rev. Lett. 17, 1179 (1966). 5. B. C. Stipe, M. A. Rezaei, W. Ho, Science 280, 1732 (1998).